What Are Your Spiritual “Handicaps”? We see someone who isn’t considered “normal” and label them as having “special needs.” Although they do have special needs, I often wonder who is “normal” and who isn’t…after all, WHO determines what is “normal”? We label people by the physical handicaps that are obvious to us, without ever taking time to see who they really are. When was the last time that you stopped to talk to someone who had an obvious handicap? Do you take the time to get to know the “special needs” person who may attend your church or live in your neighborhood? Do you have the tendency, like so many people, to overlook or even avoid these individuals because you just don’t know how to relate to them? What about their caregivers? Do you look for ways to assist them because of the extra load they carry, or do you simply feel sorry for them and keep on enjoying the “perfect” and “normal” family God has blessed you with? I remember when I first realized that my firstborn baby was considered to have “special needs.” I felt the “blow” deep within the pit of my stomach, even though I wouldn’t have traded my sweet and beautiful little boy for any other “normal” or “perfect” baby in the world. I wanted everyone to see how special my baby boy was; I wanted them to think that he was “perfect,” just like he was to me. 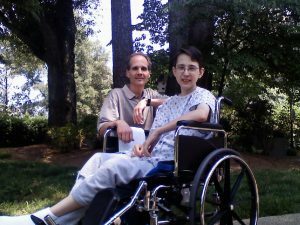 Although Austin’s health issues were often not as obvious as some other people’s physical limitations, for most of his life he needed our extra time and attention. However, I would choose each and every tear we shed, each sleepless night, and each worry we faced, all over again, and choose Austin as my son. Although I often struggled with wishing that God would have blessed him with a healthy body, I now realize that if He would have, I wouldn’t have been given the incredible gift of WHO Austin was. As Austin continued to grow and adjust to his limitations, I was amazed at the faith, grace, and strength that he possessed. His daily attitude and outlook on life put mine to shame. After all the many health issues and struggles he faced, I found myself struggling with the questions of, “Why, God?”. Let’s go back to my earlier question…Who determines what is “normal”? If we are looking at the world’s standard of “normal,” we will find that most of us don’t measure up. Few of us compare to Hollywood’s “perfect” guidelines, and this is typically what the world uses as a measuring stick. However, God sees differently than we do, and He is the ONLY ONE that should determine our self worth and whether we are truly handicapped. It is imperative that we recognize the forms of spiritual “handicaps” that are far worse than any physical ones we may have. I am painfully aware that I still live with many handicaps. I, daily, find myself struggling to speak the words of blessing to my family like I desire. When God looks deep into my heart and sees the “diseases” that are there, I wonder how “disfigured” I must look to Him. I am ashamed of my limitations and all the “special needs” that I wrestle with. Why am I still confined to living in a “crippled” body when God has given me everything I need to be complete and whole in Him? When I struggle to accept the difficulties and trials that God allows into my life, I am being controlled by a prideful and controlling spirit. When I become consumed with perfectionism and my plans, I allow fear to control me. When I speak negatively to my family, I am plagued with the “disease” of cursing rather than speaking a blessing to them. Most of the mentally handicapped people, that I know, aren’t affected or controlled by measuring up to other’s standards. They are secure and happy with who they are and find enjoyment in the little blessings of life. They are not too busy to “stop and smell the roses” along the way. Normally, you won’t find them driven with the need to achieve. Simple pleasures like a warm hug or an affectionate smile can be a great treasure to a “special needs” person. We can learn a great deal by attempting to live life better equipped and uninhibited like many of these dear ones. Now let me ask you…What is your handicap? Notice I didn’t ask if you have a handicap…Yes, it’s true! Unfortunately we ALL have at least one, but, frankly, to have only ONE would be awesome. Some of our handicaps are more noticeable and affect us in a greater way than those that are a bit more subtle. Some of them don’t interfere with our lives on a daily basis while others threaten to destroy the relationships we have, because of the severity of the handicap. When God sees you, do you appear “normal” to His standards or are you very disfigured and handicapped? Are you paralyzed by fear or controlled by a critical spirit? Does your “sharp” tongue or your complaining attitude “cripple” you from being completely free in Christ? Have you allowed Jesus to set you free, or are you still struggling with all your “handicaps”? Don’t allow your “defining moments” in life to paralyze you. Instead, use them as stepping stones of faith! How severe is your “handicap”? Does God see you in need of a wheel chair, or are you so horribly “disfigured” that you should be receiving twenty-four hour care at a “special needs” facility while receiving “life support”? What are your spiritual “handicaps”? Amen!!! Thank you Cindy, for this reminder!! I just finished reading ‘Big Mountain Bigger God” and was blessed and convicted all at the same time! Thank you so much for being willing to share your family story for God’s glory!!! To God be the glory… I’m truly blessed to have reed this inspiring story thanks for sharing. This have inspired me in multiply way I’m totally guilty of being spiritual handicap and from this day forward I will press to do better and go boldly before the throne if grace and do what God has called for me to do (Cindy) may God continue to bless you and your family in Jesus name Amen.